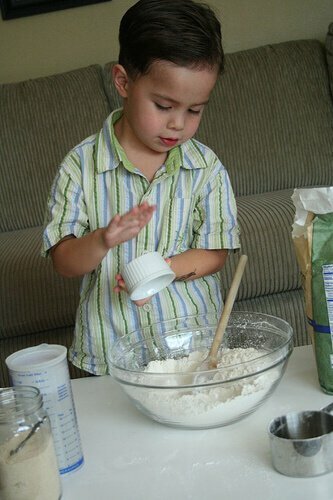 A recipe so easy, a 4-year old can make it! My son will show you how, step by step. 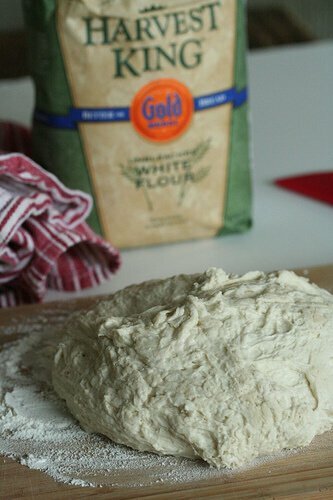 It’s been almost a year since NY Times unveiled the secret to the revolutionary No-Knead Bread. 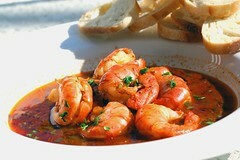 And while fads come and go, this certainly is a recipe that has transcended the fickleness of foodies. It’s time to revisit the bread…. as many of us have been brainwashed by this summer’s ice cream! We’ve made close to 60 loaves since last November and I’ve got to tell you, it is still one of our family’s favorite things to eat. I firmly believe that every person should bake a loaf of bread at least once in their lifetime. 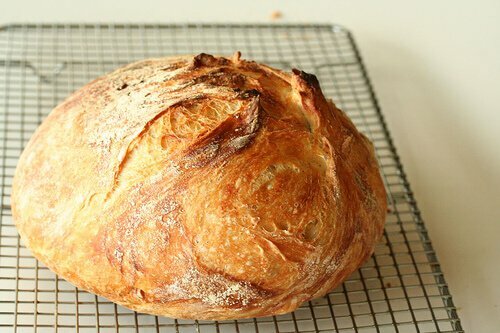 Granted, it’s easy to just drive to your local bakery to pick up a loaf, but have you ever experienced the intense joy of smelling freshly baked bread coming from your very own oven?! Foodgasmic, eyes-roll-to-back-of-head, soul softly moaning as you tug a piece of warm, pillowy mound gently with your teeth. In case you’ve not heard of No Knead Bread….let me tell you about it. 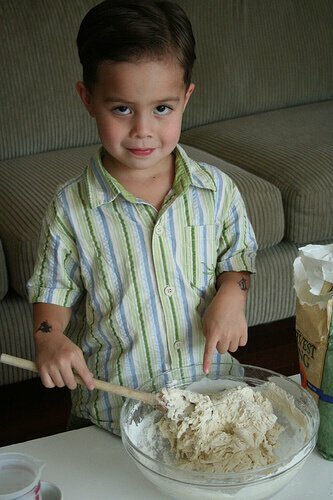 Baking bread does sound intimidating…all that kneading and loaf-shaping business is best left to pros. 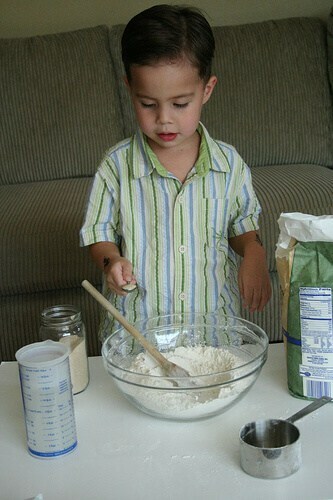 But what if I told you that you don’t even have to knead or shape, that it is so easy my little son makes it. 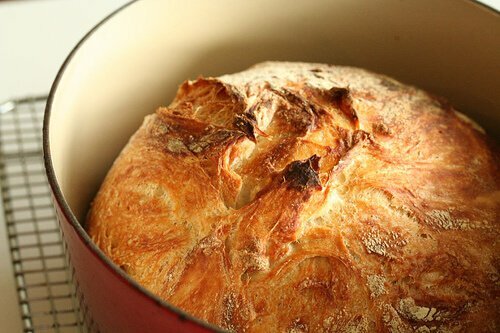 No Knead Bread recipe so insanely brilliant – no sticky fingers, no doughy mess, no intricate measuring, no complicated kneading. Totally hands-off. The crust is thin, crisp and snaps as you cut into the loaf. The interior of the bread holey, chewy, airy and light. If bread could sing, this would be an angelic choir. In Dolby digital surround sound. Now, with that, how could you not try No Knead Bread? It only takes 3 minutes to mix and a wooden spoon. You can’t even boil spaghetti in 3 minutes! 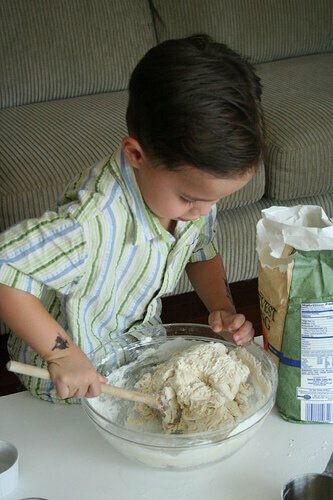 So, without further blabbering, I’ve pimped out my son to demonstrate that baking No Knead Bread is so simple a 4-year old can do it. So, let’s start. 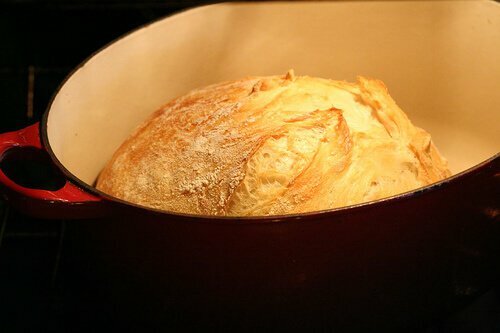 3 cups of bread flour in a big bowl. Add 1-1/2 cups of lukewarm water. Sorry no pic – he dumped water before I could pick up camera. But you know what “dumping water” looks like! Stir. Use those muscles, boy. 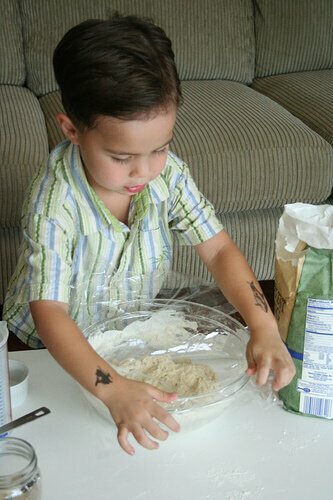 Stir like a badass-baker with whale tattoos would stir! See? This is what it is supposed to look like…a shaggy, goopy mess. Give it a kiss good night and let the no knead bread dough sleep for 12-20 hours on counter or in a nice, warm, cozy place. secret: I’ve let it sit for as little as 8 hours and it still tastes great! I did knead with wet hands just a little tiny bit to make up for the time OR you can add a touch more yeast. Wet your hands. This will prevent the very sticky dough from sticking to your hands. If you find dough sticking to your hands, wet again. 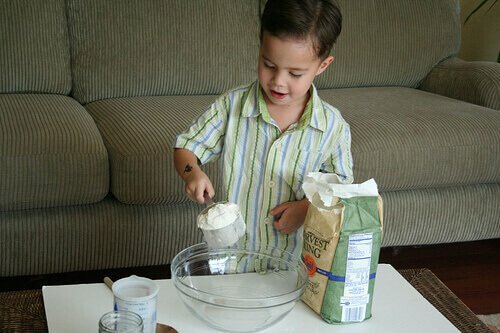 Why not flour your hands? You could, but you want to keep the flour: water ratio pretty even. Since we are adding flour to the surface, I balance it out by wetting my hands. It is the high water content that makes this bread so deliciously light and the crust very crisp. With wet hands, grab the dough and fold over all ends towards the middle. Turn dough blob over so that you get a nice, smooth, tight surface. Try to tuck the dough ends under to get that taut surface. Gently move dough onto a piece of parchment paper (I used a floured towel, but it can stick to the towel easily, so I recommend parchment.) Cover. Let nap for 2 hours. It should puff up nicely and double in size. secret: When I run out of time, I sometimes let it sit only for 1 hour! 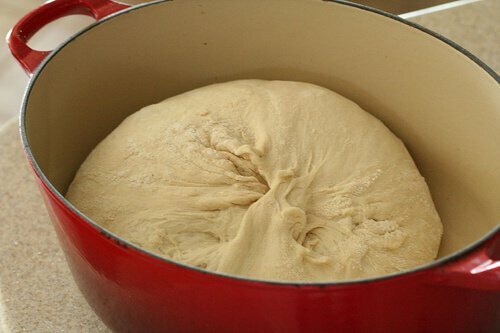 If you let it nap in a tall, narrow bowl (pictured below), the dough rises nice and tall, about 6″ high. 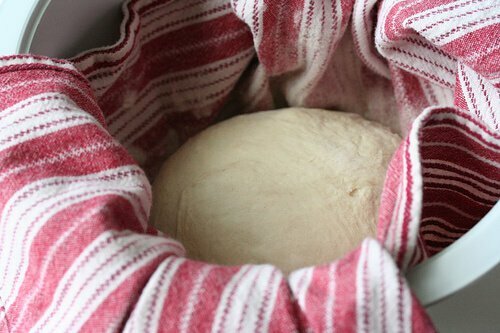 If you leave it out on the counter – that is fine too, the dough will rise up and also out….making a flatter No Knead Bread loaf, about 3″-4″ high.They will both taste the same, just looks a little different. 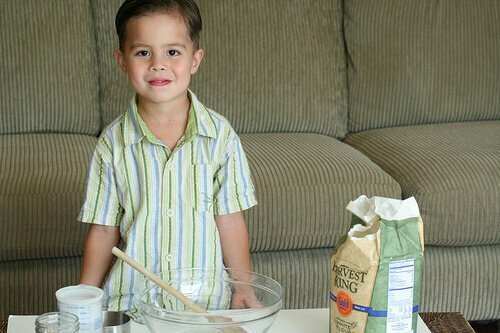 A half hour before the nap ends, we will need to begin preheating your baking vessel. Slip a covered pot into the oven. Crank up the heat to 450F. Let it pre-heat for 30 minutes or longer. Let’s talk about the pot. So, you know you’re going to put the pot into a very very hot oven. Make sure that the pot can withstand 450F. Generally, if the pot is cheap, flimsy, has plastic handles and a remnant from your poor college days, it’s probably not going to be safe to use in that hot of an oven. 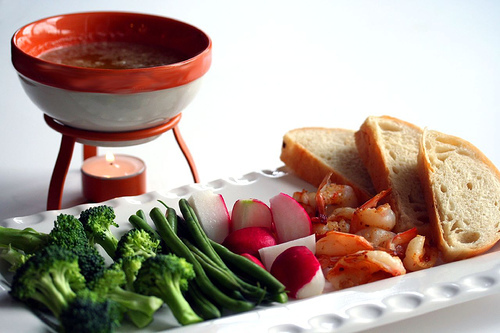 Use a 5-qt or larger cast iron, ceramic, Pyrex, stainless steel or enamel pot. Just check your pot collection – look for large, heavy, no plastic. Round, oblong – doesn’t matter. Should be at least 4″ tall. I use my Le Creuset emameled cast-iron. Yes, my cover has a thick plastic knob – but I did call Le Creuset’s customer service and they said while their literature says safe to 400F, it is still fine at 450F. Now, I don’t know whether the gal who talked with me really had the authority to tell me such a thing….but after over 30 loaves, my pot is still unblemished. After pre-heating, remove the hot pot from oven. If you’re using parchment, just lift the entire parchment with dough and place into the pot with the parchment paper on bottom. 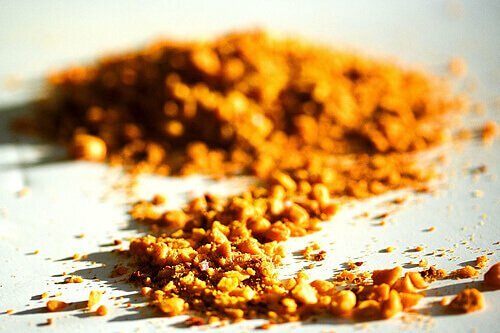 If you’re using a floured towel, place a piece of parchment paper at the bottom of your pot. This prevents the dough from sticking to the pot. Lift the towel, turn it over and just plop this wobbly dough into the hot pot. Doesn’t matter how it lands – actually, the messier it lands, the more “rustic” it looks. Shake pot a bit to even out the dough. Cover and put back into the oven. Bake covered for 30 minutes. Photo below is peeking through oven door after 30 minutes. Then uncover and bake further for 15-20 minutes. To check – you can either tap the bread (should sound low, hollow, like a drum) or take its temperature (should be 210F in middle). Here is No Knead Bread just after baking. See? I told you that “messy” turns out “rustic!” Kids- don’t you DARE tell me that your toy room looks “rustic!! !” GO CLEAN YOUR ROOM! Remove and let cool. 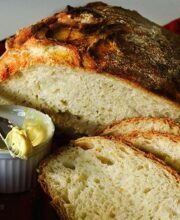 The No Knead Bread really does sing – the crust crackles as it cools. Listen to it! secret: Because the bread has such high water content- the crust will not stay crisp forever. If you aren’t eating soon, you can re-crisp the crust by re-heating it in a 350F oven for 10 minutes. Thats it! You will be rewarded with a thin, crunchy brown crust, large, open holes. The bread is slightly chewy, flavorful and perfect texture. 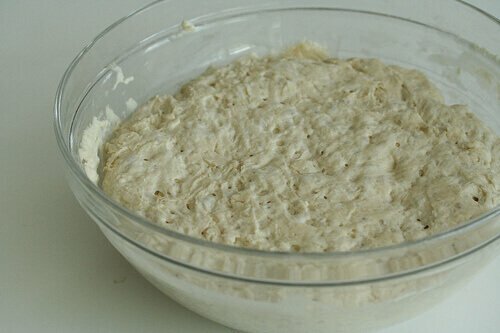 Making your own bread is deeply soul satisfying, it makes me feel like I am so close to the earth. 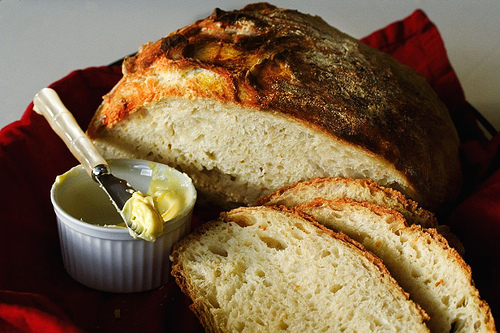 Eat with good butter – like Kerrygold or Lurpak – splurge on your butter for this loaf! Just a little story for you: The first time Andrew and I made this bread together, I let him mix all the ingredients together the night before. We watched it bake together. 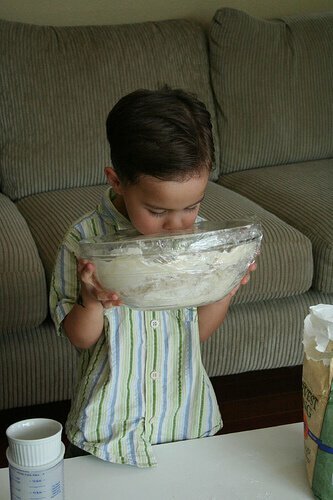 When it came out of the oven, Andrew wanted to cut into it immediately. But we had to wait until it cooled. Then it was time. As I placed the tip of my knife into the bread and moved down through the crust, the snap and crunch of the crust gave way to tender, spongy body. I knew even without tasting it, that it was the most perfect loaf of bread that I have ever made. Andrew and I slathered butter on our slices. We sat on the kitchen floor, my hands still with traces of flour, and had a wonderful moment of just enjoying bread that we made together. Just like his Po-Po, Andrew loves bread. Each time, he would come ask, More bread please with arms outstretched. I would place a warm buttered slice in his small hands – he cradled it so gently, carefully ran to the stairs, never taking his eyes off the prize. He sat on the third step and ate his bread, wiggling his toes between bites. Three times he did this. Yes, this is my son. 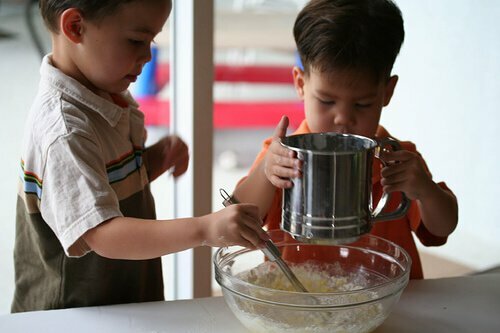 Perhaps one day when he is older, he will read this recipe and story and remember how his Mommy taught him how to eat homemade bread – with lots of butter and with eyes closed, totally savoring every single bite.